This post is sponsored by 4Knines and the BlogPaws Professional Pet Blogger Network. I am being compensated for helping spread the word about 4Knines Products, but you know Johann The Dog only shares information we feel is relevant to you, our readers.4Knines is not responsible for the content of this article . Over the past couple of months, Rach has had a major problem with traveling in the car. 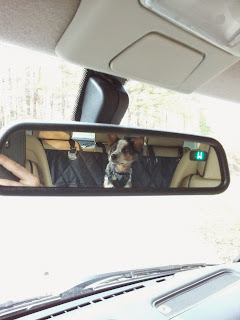 During the few trips we took, he was becoming very car sick, and very fearful of being in the car. We needed to take action now! So when the nice folks at 4Knines asked if we wanted to receive a back car seat cover for free to review, it was like they read Mum's mind! Mum wanted to try and see if Rach would be more comfortable in the back seat of our Rover, wearing a car restraint harness, instead of being in a crate like Gracie and I ride. We needed two things to try out this solution; a car seat cover that is waterproof and super easy to clean up ooopsies, and a car restraint harness. We received the 4Knines car back car seat cover and immediately started testing out Rach in his new set up. Mum started by just having him sit in the back seat on the car seat cover, clicking and treating. After that went well, she started the car and got in the front seat, clicking and treating as Rach eased some of his fears, drooling and flat ears. Within just one day he improved tremendously with no drooling in the car. That's when Mum took him down the mountain road about one half mile, clicking and treating as she drove as Rach was comfortable. Within a few days they worked up to driving almost all the way down the mountain. By that time we received the car harness restraint and used that as well as the car seat cover. It's been a little over a week, and they go for drives nearly every day. We can proudly and happily say that Rach has not drooled in in the car the entire time and never lost his dinner (even though he had just ate) in the past week of car trips! We are so grateful for 4Knines for providing the car seat cover and helping Rach feel much more comfortable in the car. Being a prospective agility dog, he has lots of car travel in his future, so this is very, very important for his happy life. When we saw the 4Knines car seat cover we loved it immediately! It comes in tan, gray and black. We chose black so as not to show as much dirt being the outdoor adventure dogs that we are. The car seat cover has velcro slots so we can easily attach Rach's car seat harness tether to the baby seat bar in the crook of the seat. It has a rubber backing so it doesn't slip at all, and it's a little padded for his comfort. We can easily hook it around the back car seat headrests to secure it. And if you want a scoop cover there are loops to hook it over the front seat headrests as well. We like leaving the scoop part down as Mum can now use the backseat floor for storing our gear on trips. The rear car seat cover is completely water resistant and cleans up very easily with a quick wipe of a damp cloth, it's machine washable and has a lifetime warrenty! One of the super neat things is that 4Knines donates $1 to the ASPCA for every unit sold, and they support multiple pet advocacy groups such as the Arizona Humane Society, Soldiers Best Friend,Marley’s Mutts, Desert Harbor Doberman Rescue and more! We're really proud of Rach conquering his fears. We noticed that the last time they got back from their test car trip, he was much more confident and happy than any of the other times. The trip didn't phase him at all!!! What a good boy! Now for the best part!!! Here's your chance to win one of these pawsome 4Knines rear car seat covesr for your pup! Just follow the options in the widget below to enter. The giveaway is open to U.S. residents only (apologies to my friends across the ponds and north and south). You need to be age 18 and older to enter. This giveaway is void where prohibited. If you win you'll be able to select the size and color of your rear car seat cover and please allow 4-6 weeks for delivery! You have until midnight ET November 30th to enter, so get cracking! Oh and, if you just can't wait like we couldn't 4Knines is having a Black Friday / Cyber Monday deal! Get 20% off! And don't forget! You need to enter through the widget below so we have a record of your entry and your email address to contact you if you win!!! Davinia is the complete opposite of Rach. She drools and throws up if she is not in the crate or carrying bag in the car. We would love one of the 4Knines cargo covers to put under our crate to keep it from slipping and keep the car cleaner. My parents really want the back seat cover for my mom's car so Whisper their Husky can go in the car and not just my dad's truck. YoYo was the same way!!! In the back seat he threw up until he was about 8 months. Then we put him in a crate and it solved everything. That's why this is kind of baffling to us, but whatever helps Rach feel comfy is what we'll do! Good luck! That's awesome that the seat cover is working for you, Rach! This is wonderful news! We would love to win one of those for our back seat! Thanks! And don't forget to enter through the widget so we have a record of your entry, K? We'd love to win one to help keep our car clean of all the debris that Rocco drags in!